That awkward moment when you excitedly click pictures from your iPhone to capture your perfect moments and get the pictures with those annoying red eyes glowing due to flash. The picture looks clumsy and that enthusiasm turns into dissatisfaction ultimately forcing you to make the pose and take the picture again. This typically happens when you try to take picture in the dim light or in the dark. Accordingly, we have reached here with this post, after reading which you will be free from this unpleasant situation and will be able to remove red eye using iPhone. We will also offer some useful red eye remover apps. So, let's begin fixing red eye through iPhone as well as apps. 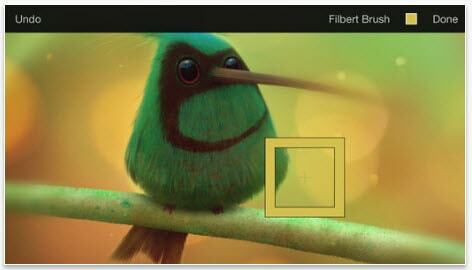 Filmora9 provides much more intuitive interface to help creators to empower the imagination. Beside the basic video editing, you can now do visual audio editing further. This section will provide you the steps for red eye correction on iPhone. Please note that you will need an iPhone running with iOS 7 and later. Read along to get the steps and fix red eye with iPhone. Step 1 – tap on the "Photos" app in your iPhone. Post launching the app, look for the layered rectangles icon located at the bottom right corner of the screen. This icon is for "Albums". Tap on it and proceed to the next step. Step 2 – Now, tap on "All Photos" appearing on the screen followed by choosing the image you wish to edit. Step 3 – Choose the "Edit" option from the screen and then you are required to tap on the "Red Eye Correction" option. This eye correction icon will be the image of an eye from which a slanting line is crossing through it. Note: The "Red Eye Correction" option will not appear when the picture is captured without the use of flash. It will only be visible on the photos taken with flash and the screenshots. Step 4 – After this, tap the red eye one by one and the red eye correction feature will change pixels as needed on the tapped area. You can tap eye once again if the edit was not of your preference. Step 5 – lastly, tap on the eye with slash icon i.e. "Red Eye Correction" icon to return to the main edit screen. Hit on "Done" once satisfied with the results. If in case, you feel the changes are not according to what you needed, you can again go to the edit screen and hit on "Revert" option. This will restore the original picture. After making you aware with the tutorial to remove red eye with iPhone, here are 5 apps that will help you for the same. Do numerous edits to the images apart from removing red eye such as crop, rotate, remove blemish, and add effects, borders and more. 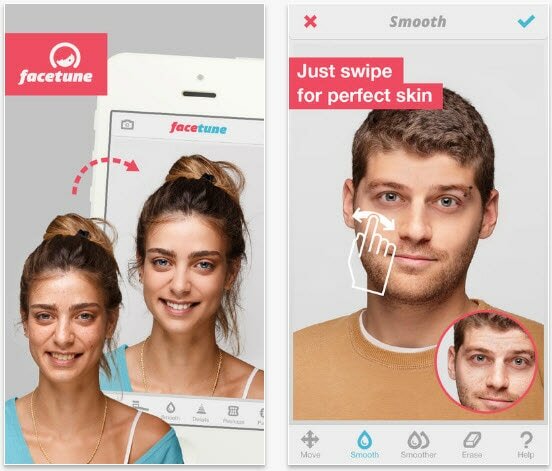 Another red eye remover app in the list is Facetune. The app is available in the App Store and will demand a little penny of yours. Besides removing red eyes, see what's more Facetune can do. Who doesn't want a smiling face and what if your smile looks more enhanced? Facetune can help in widening your smile brightening the teeth as well. 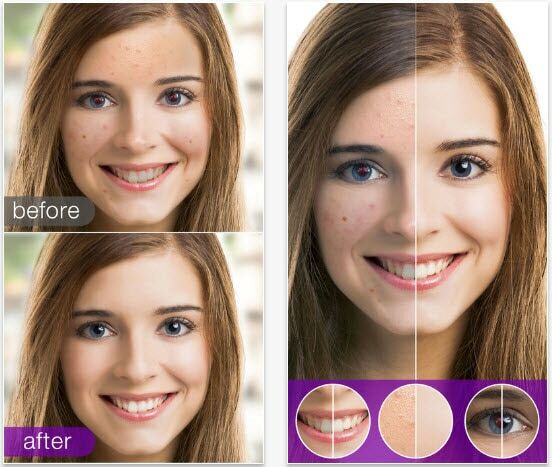 You can get the beautiful skin in your pictures via Facetune by removing pimples or blemishes etc. The app can also work as hair salon, makeup artist and help in sharing the files to the friends too. Pixelmator helps in editing photos in different aspects like sharpening, blur, add effects, delete image imperfections etc. With this app, you get full painting enhancement features to give a touch up to your paintings. It shows a great compatibility with various formats. Face enhancement like eye or skin makeup, teeth whitening, artistic effects etc. It comes with a wide range of filters, sticker, touch-up tools and frames. 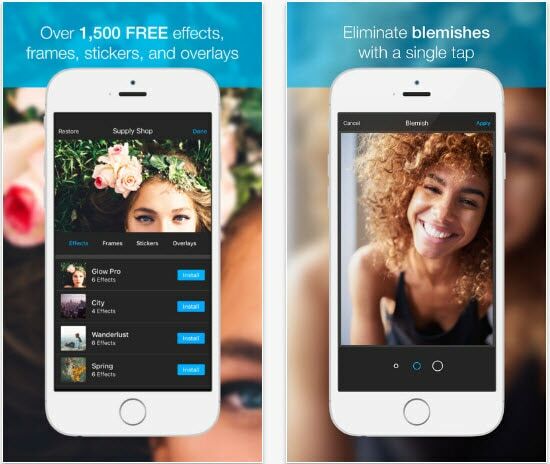 You can alter the brightness, highlights and more according to you via this app. The photos can be easily shared to Instagram, Twitter or Facebook. After removing the red eyes from your iPhone photos, it’s time to make your photos to next level by making them into a video. 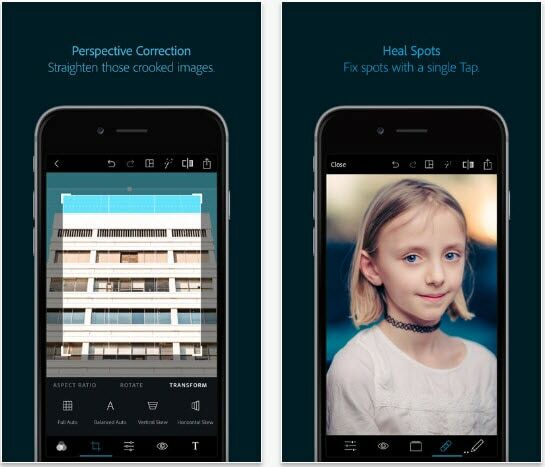 Making videos from the photos you taken with iPhone is easy if you are using Filmora9 since it supports import photos from iPhone directly and has several different aspect ratios for you to choose. You can add titles, transitions, filters and overlays to photos and choose the royal free music from the sound library.